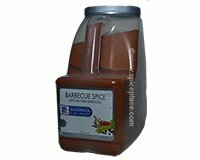 Use McCormick Barbecue Spice for grilling, barbecue and anytime seasoning, McCormick Barbecue Spice is designed to impart a hot and spicy character. BBQ Spice is hot to the taste and has a spicy, pungent aroma. Nutmeg, cloves, and coriander give the blend a pungent earthiness and rich aroma as well as color. Barbecue Spice has a peppery profile as well as a rich, red-orange color. Barbecue Spice is a blend of spices (including celery seed, coriander, black pepper, and red pepper), paprika, salt, onion, garlic, and silicon dioxide (added to make free flowing).